I count 1,058 names in the latest Quarterly Publication of Individuals Who Gave Us At Least $2,350, which has just been placed on public inspection for printing in the Federal Register next Monday, a mere nine days later than required by law. Meanwhile, the FBI, which also tracks American emigrants who renounce citizenship (but not those who relinquish in other ways) for the National Instant Criminal Background Check System (NICS), says that NICS had 27,240 renunciant records on 31 December 2014, and 32,666 renunciant records a year later, for an increase of 5,426 during the year 2015, and another 253 in January. Only 4,279 names showed up in the Federal Register in the same period, meaning that the IRS missed more than eleven hundred of us at minimum. The pre-print of this quarter’s list takes up 27 pages. Most full pages have 41 names; two pages (11 and 25) have only 40 names due to long names taking up two lines. There’s 22 names on the first page, and 13 on the last page. So unless I’m even worse at math and counting than the U.S. government, that’s 1,058 names. The IRS’ Federal Register list is far from the only illegally-late government report these days. For example, under 19 USC § 2432(b) (part of the hilariously hypocritical Jackson-Vanik Amendment), the State Department is required to give Congress “information as to the nature and implementation of emigration laws and policies and restrictions or discrimination applied to or against persons wishing to emigrate”, so that Congress can confirm whether the President is correctly exercising his obligation to sanction countries which “impose more than a nominal tax on emigration or on the visas or other documents required for emigration, for any purpose or cause whatsoever”. However, State’s report on the emigration policies of Azerbaijan, Kazakhstan, Tajikistan, and Uzbekistan was around two weeks late, according to the Congressional Record — it was supposed to have been submitted to Congress by the end of last year. 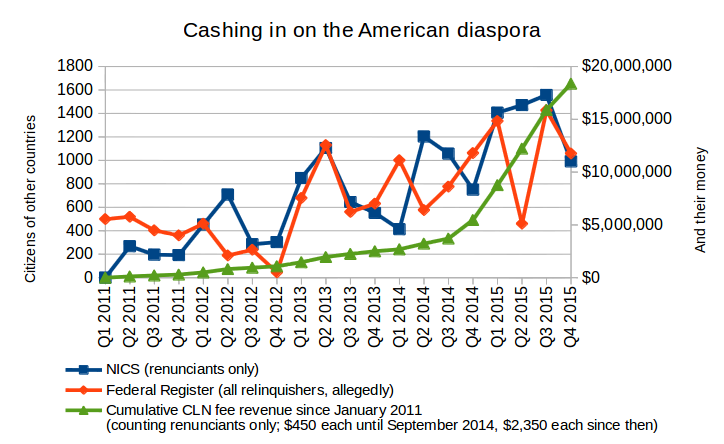 In total, since then-Secretary of State and current presidential candidate Hillary Clinton first authorised the imposition of a $450 fee on renunciants back in 2010, they’ve collected more than $18 million from people who don’t want to be Americans any longer. Here’s a table of seventeen people mentioned by name in media reports as having given up U.S. citizenship since the beginning of 2014; nine of their names have not yet appeared in the Federal Register (four out of eleven from 2014, and five out of six from 2015). I’ve also included one person who posted his own CLN on Twitter and later showed up in the list (I haven’t included people who tweeted their own CLNs but didn’t show up in the list). Oddly enough, not a single one of these showed up in the Q4 2015 list. Maybe I’m just missing some media reports of famous people who gave up citizenship and did show in the revenue list; if you know of any others, please leave a comment. In any case, a non-publication rate of more than one-third for 2014 is still pretty bad. The below table lists the monthly additions to NICS for 2011–2015, compared with the quarterly lists in the Federal Register. The FBI has the bad habit of uploading the new NICS report each month at the same URL as the old one; the only way to keep a verifiable collection of old reports is to save old ones in the Internet Archive each month, and unfortunately we didn’t remember to do this for all months. If the month is set in upright type, the link goes to an actual Internet Archive copy of the FBI NICS report for that month. If the month is in bold type (for December), the link goes to the NICS annual operations report for the appropriate year. Finally, for months in italics, the link goes to a Brock post or comment. A few caveats. The “addition” figure for April 2011 refers to all additions since December 2010. The “addition” figure for October 2012 includes what the FBI described as a “backlog” of 2,900 renunciant records, also included in the annual total for that year. I also gave an estimate of what the annual total would be without the backlog, even though some of the backlog may relate to other periods covered by the chart. The Department of State is collectively charging us millions of dollars to exercise our human right to change our nationality, while the “Internal” Revenue Service refuses to compile an honest list of our names as required by their own laws. Meanwhile, the Department of “Justice” continues to seethe about U.S. persons “concealing foreign accounts and evading their U.S. tax obligations” and threatens that “[t]hose who underestimate the ability of the United States to pursue offshore tax evasion do so at their own peril”. With this kind of attitude from the U.S. government, expect the ten-month consular wait list for renunciation appointments to get even longer. Other governments COULD pass their own laws and issue CLNs in their territory whereby allegience is disavowed to Country A and a CLN is issued that is valid for public and private purposes. Ha! Renounce at a Service Canada office and let THEM send the information to the Department of State… and eat the renunciation fee! @George: Other governments COULD pass their own laws and issue CLNs in their territory whereby allegience is disavowed to Country A and a CLN is issued that is valid for public and private purposes. I’m very curious to know whether it would work for banking purposes (as a FATCA “reasonable explanation” of not having a CLN). Unfortunately I guess we won’t find out in this particular case, cuz the guy says he’s also going to go to the US Embassy and pay the $2350 to get their CLN as well once he can get an appointment. The Filipinos seem to have designed this system back when the US State Department still agreed that 8 USC 1481(a)(2) actually meant something. 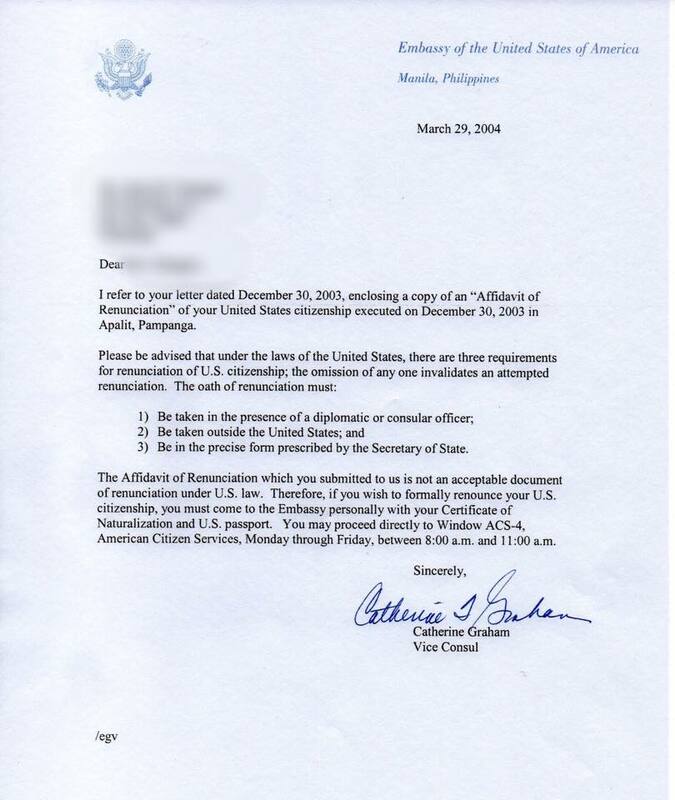 Incidentally, back in 2003 another Filipino politician also swore the above oath, but the US Embassy in Manila responded by sending him a very misleading letter stating that it didn’t meet the requirements of 8 USC 1481(a)(5) renunciation, while mentioning nothing at all about 8 USC 1481(a)(2). Another country probably could have a CLN-substitute for purposes within that country, but if it’s not official with the U.S. government the (possible-former) U.S. citizen risks problems if (s)he ever steps foot back on U.S. soil (even to just visit). The US oath of citizenship contains language (“I absolutely renounce and abjure all allegiance and fidelity”) whereby the new citizen must renounce any previous citizenship. None of that means anything to the old country but it apparently makes the US government happy and in their minds then gives them full authority to ignore any other country’s claims. (Invoking Master Nationality, right?) Canada’s oath of citizenship used to have similar language but it was deleted back in the 70′s. I wouldn’t mind seeing that language reinstated in Canada’s oath, at least for certain countries which practice CBT. That way the Canadian government could conveniently ignore any US claims on its Canadian citizens because the individual would officially NOT be a US citizen under Canadian law. 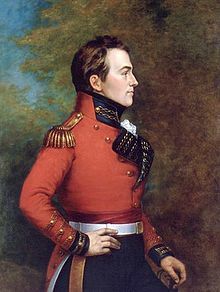 I see no reason why the Canadian government couldn’t allow a person to renounce their US citizenship in Canada; they merely have to make it possible. As we seen, our government seems to have no particular interest in protecting its citizens, but its hard to believe that it has no interest in protecting its tax base. This would be meaningless in the US, of course, but who cares? This would really only be a recognition and official implementation of the Master Nationality Rule in Canada. Oh but the Canadian government will protect Canadian citizens with terrorism convictions! I find it interesting that as far as I can see, the fees (contentious and exponentially increased) for renouncing and now for relinquishing are not mentioned at all in this report, though the fee increases and history of other functions are. Nor does the report even acknowledge the processing of renunciations and relinquishments as UCIS functions or as contentious or flagged in any way. No mention of growing backlog either. So if I’d have just kept my mouth shut, I’d have not been in the federal register? No matter. I’ve resigned myself to never visiting the US again. There’s plenty of the world I can visit without passing through the the United States of America, and still instill the values my parents (one American and one Canadian) managed to pass on to me. Sometime late in 2017 the new US Embassy in London is expected to open. The cost of this building will exceed US$1 billion. The US State Department spares no expense when it wants extravagant digs.